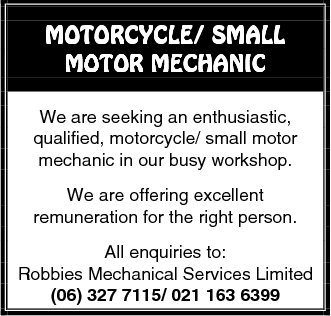 Download "Small jobs and pocket money." 1 Small jobs and pocket money. Outside school, teenagers have time in the English-speaking world! It is very common for teenagers to work before or after school to earn (= to get, to make) pocket money. There are lots of jobs you can do: you can baby-sit, deliver pizzas, do a round of newspapers, cat sit or walk dogs for neighbours (photo), pick up kids after school, help the children with their homework or look after them when the parents are not in, do the gardening for old people in your street, do the house chores (= hoover the floor, do the ironing and cleaning, etc), wash cars in your street: the list is long. You can save the allowance (= salary) you get in your bank account or spend it on what you want : Cds, sweets, food, clothes, etc. This system teaches you how to manage a budget, but you must also find time to do your homework: your school-results can drop if you don't work a lot! 3 On this o...-p... d..., the t... is h... the floor. With a s... j... outside school, you l... how to m... a budget! Are you i... i.. e... (= m... / g...) pocket-money? It is perfectly possible in the E...-s... world! A l... o...young p... have a p... -t... job b... or a... going to school. You can walk dogs for your neighbours, you can go s... for old people, you can do some g..., you can take k... to school in the morning and / or p... them u... after school in the afternoon and l... after them. You can w...the cars in your street! Pocket-money you w... get if you w...will be your money and you can s... it o.. what you want: s..., Cds, clothes, jewellery, etc. The advantage of this system is: you l...h... to manage a budget. But i.. you w... a lot o... school, d... forget to find time to do your h... too!!!! 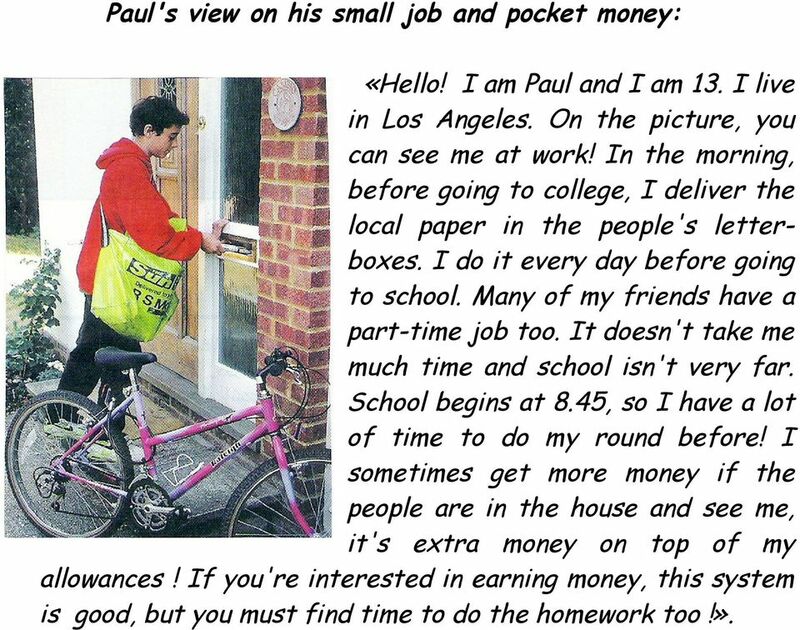 9 Paul's view on his small job and pocket money: «Hello! I am Paul and I am 13. I live in Los Angeles. On the picture, you can see me at work! In the morning, before going to college, I deliver the local paper in the people's letterboxes. I do it every day before going to school. Many of my friends have a part-time job too. It doesn't take me much time and school isn't very far. School begins at 8.45, so I have a lot of time to do my round before! I sometimes get more money if the people are in the house and see me, it's extra money on top of my allowances! If you're interested in earning money, this system is good, but you must find time to do the homework too!». 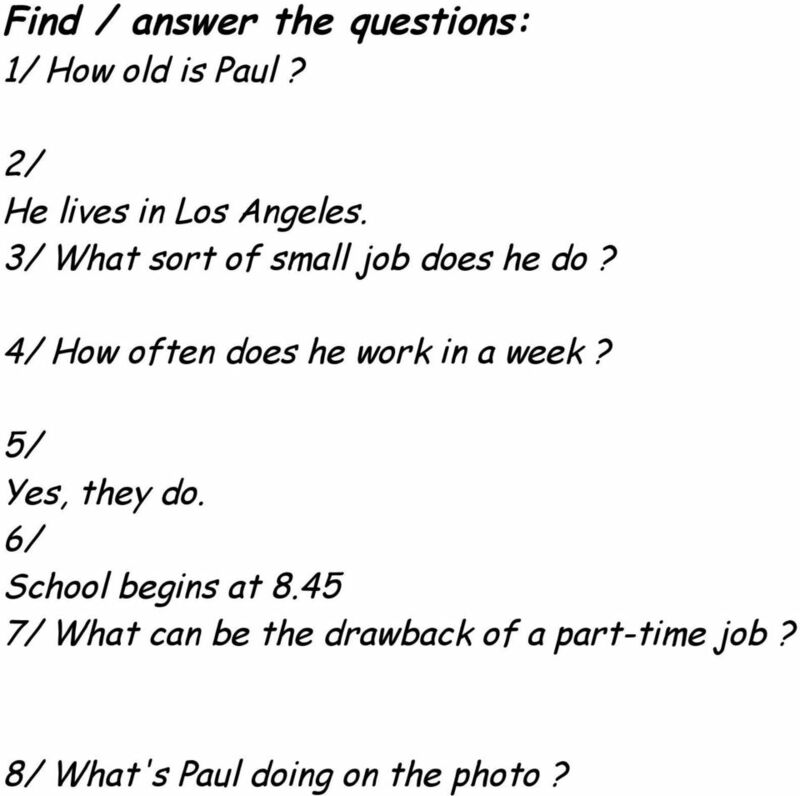 10 Find / answer the questions: 1/ How old is Paul? 2/ He lives in Los Angeles. 3/ What sort of small job does he do? 4/ How often does he work in a week? 5/ Yes, they do. 6/ School begins at / What can be the drawback of a part-time job? 8/ What's Paul doing on the photo? 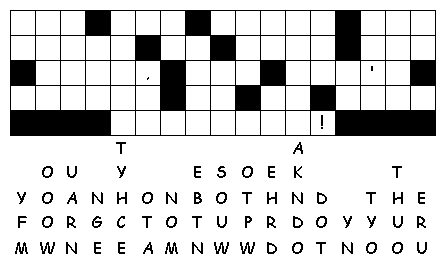 12 A/ Fill in the gaps: H... name is Tim. He e... (= m.../ g...) $ a/p... week. 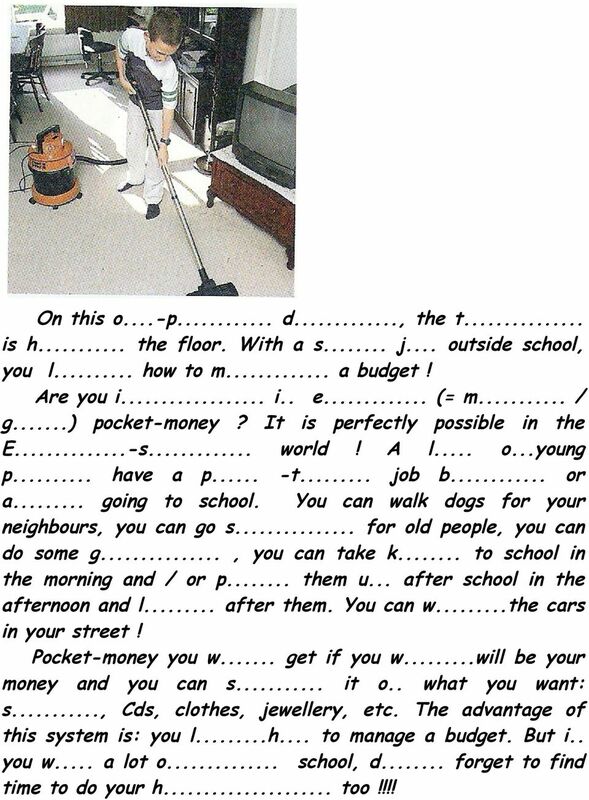 His parents give him the money (= a...) on condition he f... the cats, w... the plants and t... his room. 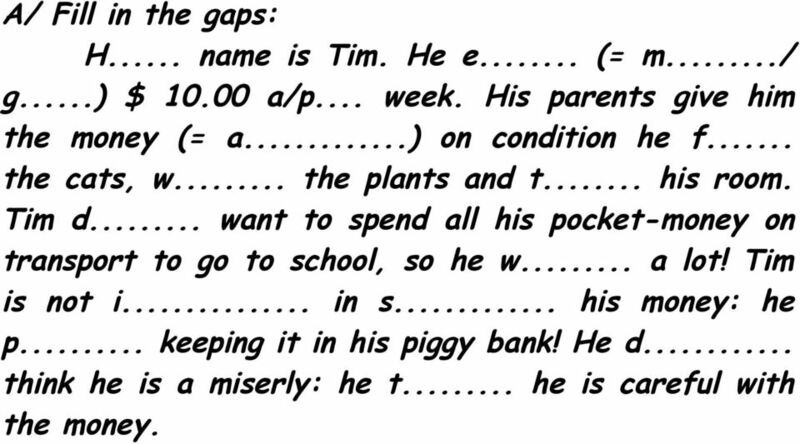 Tim d... want to spend all his pocket-money on transport to go to school, so he w... a lot! Tim is not i... in s... his money: he p... keeping it in his piggy bank! He d... think he is a miserly: he t... he is careful with the money. 14 Questions: 1/ What is her name? 2/ How much pocket-money does she make? 3/ How often does she get her pocket-money? 4/ What does she have to do to get it? 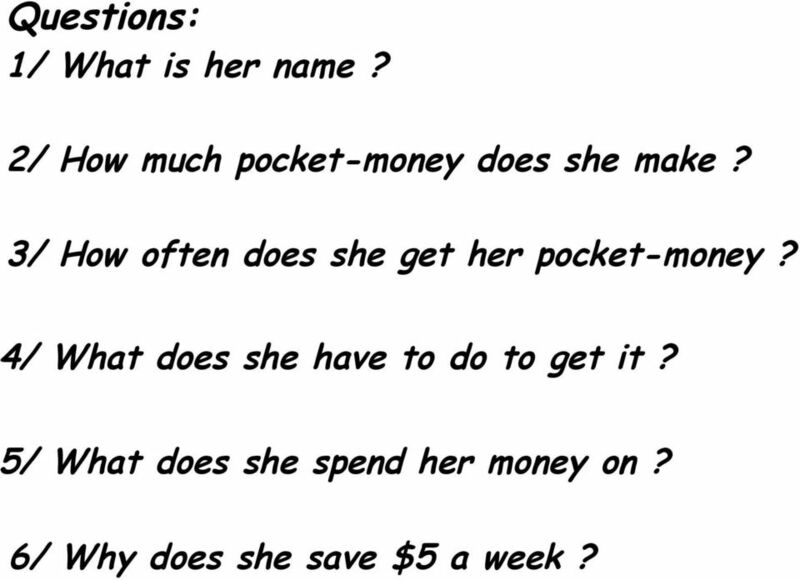 5/ What does she spend her money on? 6/ Why does she save $5 a week? 16 Write into English: 1/ Hilary perçoit/ touche dollars par semaine. 2/ Elle doit arroser les plantes, passer l'aspirateur, nettoyer des chambres et donner à manger au chien. 3/ Elle reçoit son argent le vendredi. 4/ D'habitude, elle dépense tout, car elle ne peut pas acheter tout ce qu'elle souhaite. 18 This b... and w... d... is a...pocket-money in two E... - s... countries (the USA and the United Kingdom). 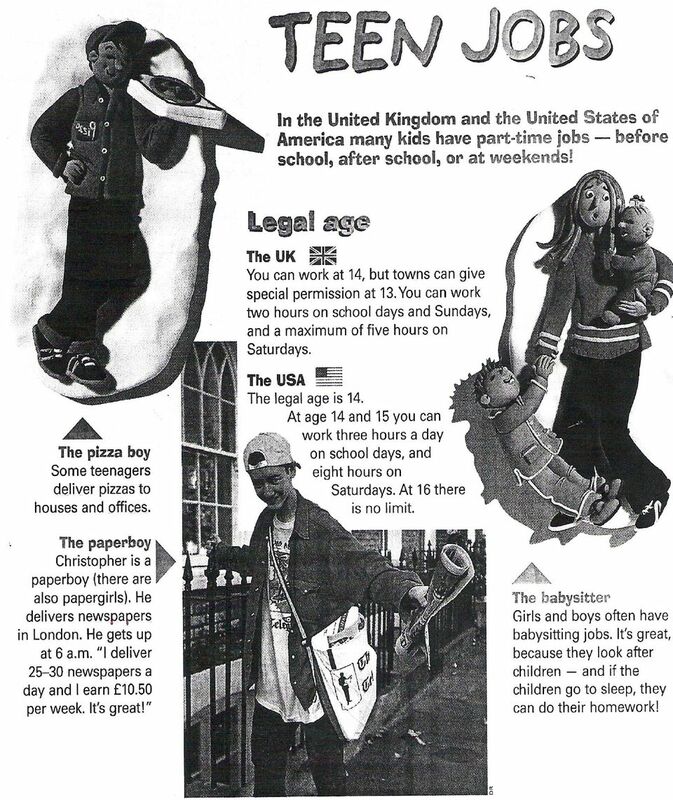 In the UK, you can b... to work from the age of 14 (2 hours... / p... school-day). In the USA, work can s... from 14 ( 3 hours... / p... school-day). T... are lots of possible jobs: b...-s..., d... pizzas or newspapers, h... children in their homework, etc. 19 Write into English: 1/ A partir de l'age de 14 ou 16 ans, tu peux te faire de l'argent de poche dans les pays anglophones. 2/ Tu veux bosser en dehors de l'école? Fais un petit boulot! 3/ Avec ta paye, tu as la possibilité de mettre de coté sur ton compte en banque ou de dépenser dans ce que tu souhaites. 4/ N'oublies pas de travailler pour l'école si tu ne veux pas chuter! 21 ... name is Helen, she is 14 (......). She... in /... from Australia. Her job is to for neighbours in her street (see photo). She does it about... in a week: on the Wednesdays and Saturdays. She also... for her neighbours (the woman has just had a baby): Helen l... a... the baby o... (=one t... a week). Helen...small jobs are OK: she... /... /... a good sum of money. She... spend all her money (next summer, she... buy an airplane ticket to visit London and Paris!) So, she... on her bank account. 23 Who : Sarah Fitzpatrick. How old : 17 Where : Seattle, USA. What : Sale-assistant in a clothes-shop How often : One time per week (on Saturday afternoons) Timetable: between 2.00 and 6.00 pm Allowance : $50.00 Why : Cds and DVDs, going out with friends, driving licence Savings: About $15.00 Interests in the job: meeting new people, training for future job. 25 Who? John Williamson How old? 14 Where? Atlanta, USA What? paper-boy How often? three times a week, after school Timetable? from 3.30 p.m (about 45 mn in all) Allowance? $35.00 Why? extra money for hobbies (base-ball and computers), Cds, going out with friends. Savings: about $10.00 Interests in the job: the money only! 27 Read this interview of Kevin, a young British teenager. Journalist: Hello Kevin! Can you speak a little about you? Kevin: I live in Manchester. l am 15. I have a part-time job to get pocket-money, a lot of my friends do it too. They deliver newspapers before going to school. J: What sort of job do you do? K: I work part-time to deliver pizzas to people. J: How often do you work? Kevin: I work about three or four times a week, it depends on the period in the year. J: Are you interested in this job? K: Not really, I am interested in getting the money! J: Can you do your homework too? K: I am not complaining and I have no other choice! J: What do you think of this system? K: I think it is good, it teaches me what money is. It is rather a frequent business in America (my cousins live there), but I guess they don t work on the continent in France or Italy, Germany. With the money I earn, I can save, or spend on what I want. J: Thank you Kevin and good luck! 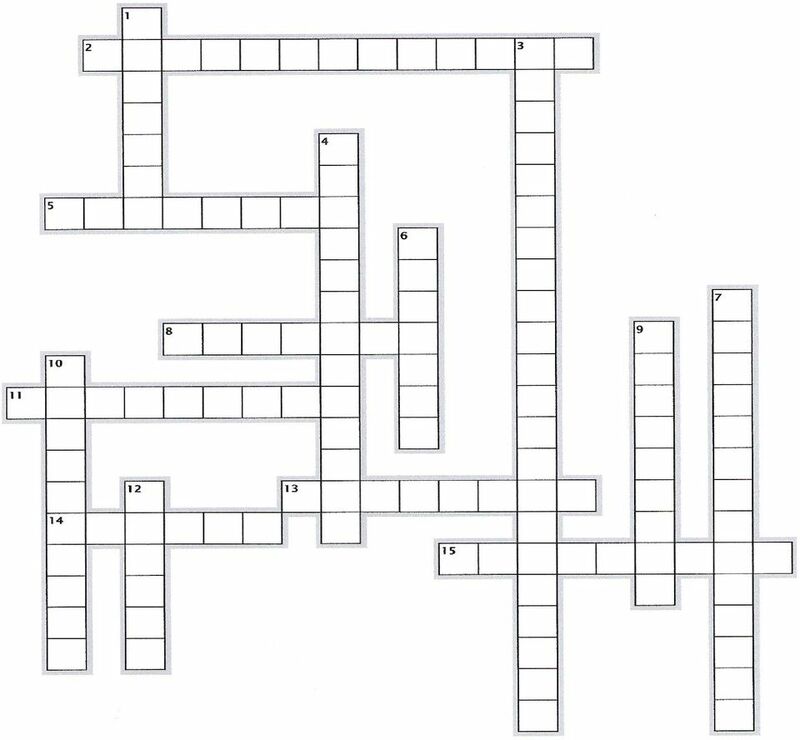 28 A/ Find the questions or answers: 1/ He is 15. 2/ He lives in Manchester. 3/ Does he ever work after school? 4/ He works in a pizza restaurant. 5/ How often does he work? 6/ What is he interested in? 7/ What does Kevin think about this system? 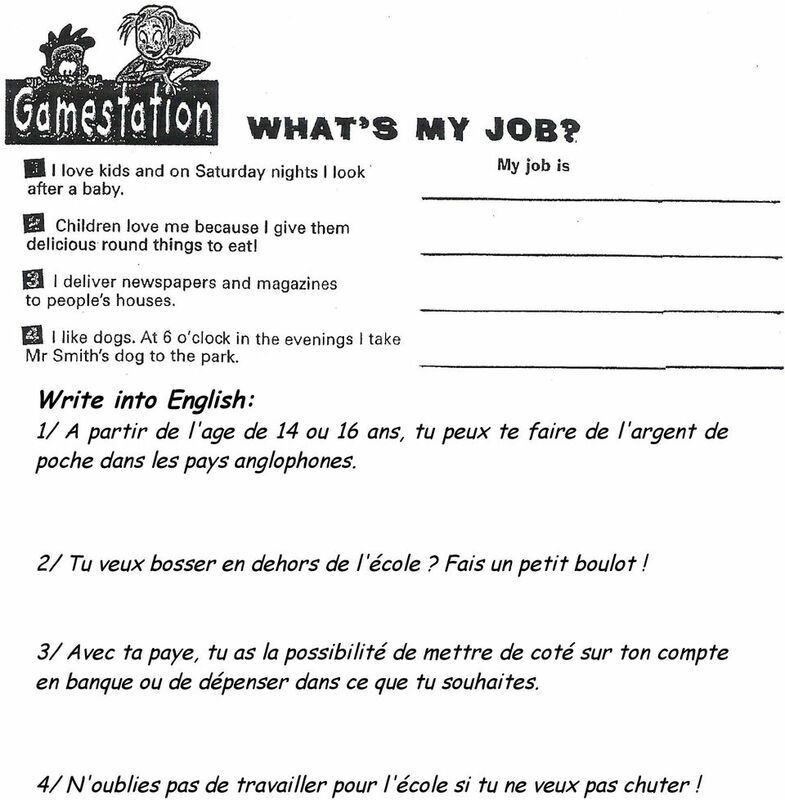 29 B/ Write into English: 1/ Ca t intéresse un petit boulot avant ou après l école? 2/ Que peux-tu faire pour gagner de l argent? 3/ Tout est possible : promener les chiens, garder les chats,faire du babysitting, faire les courses pour les anciens, aller chercher les enfants à l école, faire le jardin, ou effectuer les taches ménagères. 4/ Des adolescents économisent de l argent car ils vont chercher des petits enfants à l école. 5/ Le système des petits boulots est assez fréquent dans le monde Anglophone. 6/ Est-ce-que tu crois que c est un bon système? 7/ Le problème est que l adolescent peut parfois ne pas travailler à l école. 8/ Tu préfères dépenser ou économiser? 9/ A quelle fréquence travaille-t-il? 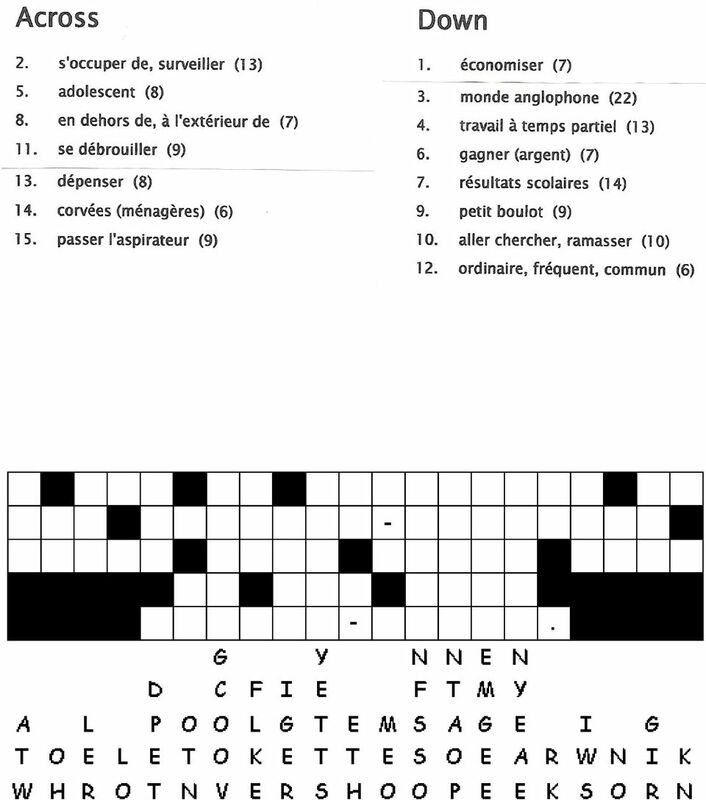 Remédiation 2 Déterminant/Nombre 1. les Articles (the, a ou article Ø ) et Nombre (singulier Ø ou pluriel -s) 6 combinaisons possibles : Ø Ø : du, de la (le, la). exemples : Ø CrimeØ is rife in this city. Rencontre d Ulrike Weinspach avec un groupe d élèves de St.Mary s Academy à Palo, le 9 juillet 2015. Task 3- Write 4 sentences about sports you like/don t like. Use your vocabulary to help you. What time is it? It s five o clock. [you hear: sizeur] It s six o clock. [you hear: seteur] It s seven o clock. It s eight o clock. It s 2 P.M.